Photographs are worth a thousand words, and there’s a lot they can tell about a particular moment of our past. Often, we can be caught up in the moment without realizing what’s ahead in the future. Sadly, we can be faced with a wide range of misfortunes in the moments after the picture without any warning. Below, we put together pictures which offer insight into the eerie moments just before tragedy struck. 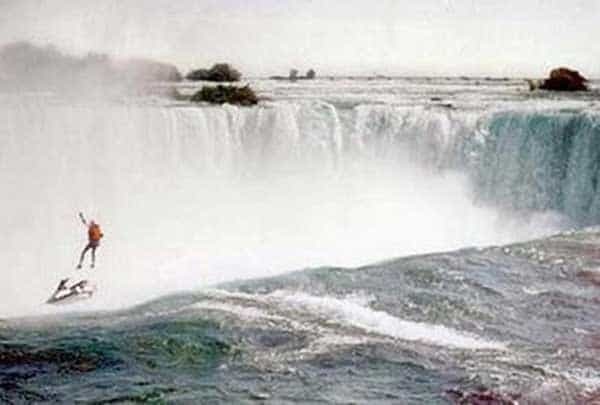 In an effort to raise awareness for the homeless with a Jet Ski stunt over Niagara Falls, Robert Overackers’s parachute failed to open midair leading to a fatal crash-landing. He was confirmed dead at Greater Niagara General Hospital one hour after this photo was taken.